Jim has over 40 years of experience practicing law. He has focused his practice on white collar crime, civil litigation, and personal injury. Jim has been a Lieutenant in the U.S. Army, serving in Vietnam with the 101st Airborne Division. He has also served as an Assistant United States Attorney and as a member of the Virginia House of Delegates. In 2015 Jim co-wrote the book, I Am Charged With a Crime, which includes experiences from his legal career and his life and also offers advice to people facing a wide range of criminal charges. If you are seeking a civil litigation attorney of Fairfax County, look no further. He has a peer review rating of “AV” from Martindale-Hubbell, the highest peer rating an attorney can obtain. Jim has also been recognized by AVVO as having a 10 out of 10 rating. 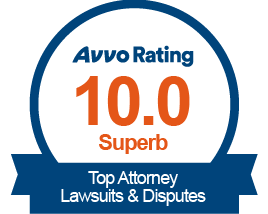 This rating reflects his exceptional reputation and experience as an attorney. In 2018 Jim was recognized by Attorney and Practice Magazine’s Top 10 Attorney List. 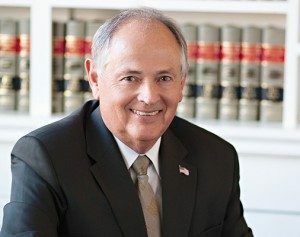 Beyond the law, he actively volunteers of his time for his faith, The Church of Jesus Christ of Latter-day Saints, where in 2007 he served full time as the President of the Alabama Birmingham Mission for three years. He is married to Sharon Spieks of Avondale, Georgia, and they have two daughters and five grandchildren. United States v Dr. Mark Capener, United States District Court, Nevada (Reno Division Case 3:05-cr-114 RCJ (RAM)). After a jury trial lasting over a month Dr. Capener was acquitted of all 52 counts brought against him. After the trial, the trial judge, in a rare ruling, required the Government to pay part of Dr. Capener’s attorneys’ fees and expenses. (See Order) The ruling against the Government is now before the Ninth Circuit Court of Appeals in San Francisco. Mr. Tate has served on the Fairfax Red Cross Board, the 4-H Board, and the Symphony Advisory Board. In their 262-page modern “horn” book, James Tate and Charles. Van Hardenbergh have created an “A-Ha!” explanation of a difficult-for-lay-folks to understand subject: the American Criminal Law System from two trial lawyers’ perspectives. Criminal Law basically is a series of socially defined “Thou Shalt Nots” backed up by penalties that include fines, jail time, and death sentences. Where the sticky part surfaces is when it is up to a judge or a jury to determine guilt in the absence of absolute fact. That is where logic, precedent, and uncertainty meet and where a good trial practice attorney must assess the odds of victory or defeat. And THAT is the subject which two exceptionally good trail practice attorneys are presenting in this horn book format. (Horn books are the law student’s “tell it ALL to me NOW!” synopses of the law in different specialties). This book explains to a rational defendant that he or she must consider those same odds, completely apart from whether the client believes that the issue is guilt or innocence alone. How should a client plead and why? Jury versus judge? The value of strategy. Picking your turf and evening the odds. A whole lot of basics going on, and all populated by examples you will find difficult to forget. Bottom line: Do NOT go into court without having read – and heeded – the warnings in this outstanding book. Thank you, Mark & Sally C.